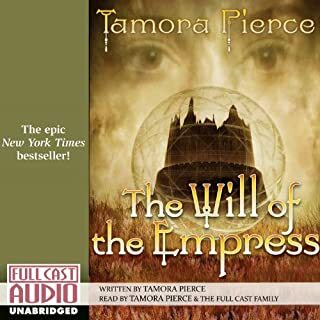 Tamora Pierce begins a new Tortall trilogy by introducing Beka Cooper, an amazing young woman who lived 200 years before Pierce's popular Alanna character. 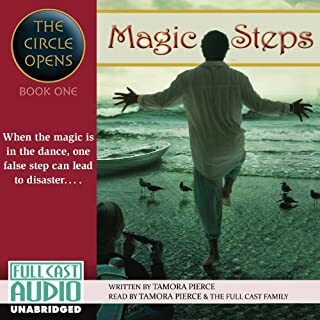 For the first time, Pierce employs first-person narration in a novel, bringing readers even closer to a character they will love for her unusual talents and tough personality. Doesn't do the book justice. 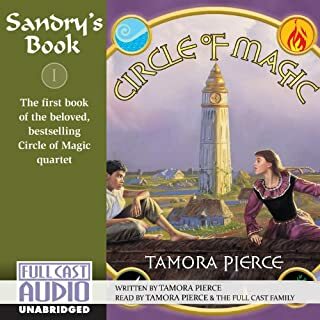 Tamora Pierce brings readers another Tortall adventure! Alianne is the teenage daughter of the famed Alanna, the first lady knight in Tortall. Young Aly follows in the quieter footsteps of her father, however, delighting in the art of spying. When she is captured and sold as a slave to an exiled royal family in the faraway Copper Islands, it is this skill that makes a difference in a world filled with political intrigue, murderous conspiracy, and warring gods. Add 3rd and 4th book please! A treat for any fan! Chosen by the Companion Rolan, a mystical horse-like being with powers beyond imagining, Talia, once a runaway, has now become a trainee Herald, destined to become one of the Queen's own elite guard. For Talia has certain awakening talents of the mind that only a Companion like Rolan can truly sense. But as Talia struggles to master her unique abilities, time is running out. For conspiracy is brewing in Valdemar, a deadly treason that could destroy Queen and kingdom. Opposed by unknown enemies capable of both diabolical magic and treacherous assassination, the Queen must turn to Talia. She was Tarma. Born to the Clan of the Hawk of the nomadic Shin'a'in people, she saw her entire clan slain by brigands. Vowing revenge upon the murderers, she became one of the sword-sworn, the most elite of all warriors. She was Kethry. Born to a noble house, sold into a hateful "marriage", she fled life's harshness for the sanctuary of the White Winds, a powerful school of sorcery. United by sword-spell and the will of the goddess, Tarma and Kethry swore a blood oath to carry on their mutual fight against evil. Together, sword master and sorceress set forth to fulfill their destiny. Ever since she was a tiny child, Sabriel has lived outside the walls of the Old Kingdom, away from the random power of Free Magic, and away from the Dead who won't stay dead. But now her father, the Mage Abhorsen, is missing, and to find him Sabriel must cross back into that world. Take one bored princess. Make her the seventh daughter in a very proper royal family. Have her run away. Add one powerful, fascinating, dangerous dragon. Princess Cimerone has never met anyone (or anything) like the dragon Kazul. But then, she's never met a witch, a jinn, a death-dealing talking bird or a stone prince either. Princess Cimerone ran away to find some excitement. She's found plenty. Karigan G’ladheon, running away from school, is traveling through a deep forest when a galloping horse pounds up to her, its rider impaled by two black-shafted arrows. With his dying breath, he tells her he is a Green Rider, one of the magical messengers of the King. Before he dies, he makes Karigan swear to deliver the message he’s carrying, and gives her his green coat, with the symbolic brooch of his office. This third book in the Song of the Lioness quartet continues Alanna's saga as she strikes out alone and discovers herself anew. A knight at last, Alanna of Trebond heads out to seek adventure in the desert of Tortall. Captured by desert tribesmen, she is forced to prove herself in a magical duel to the death. But her real challenge doesn't come until after she wins. As the first female shaman, Alanna must fight to change the ancient traditions of the stubborn desert tribes, for their own sake and for the sake of all Tortall. Follow Alanna of Trebond's quest to knighthood in the Song of the Lioness series. They were my childhood. I reread them often. My kids will read too because they have such good messages. Their only complaint was that it was over too soon. Thank you for another great installment. 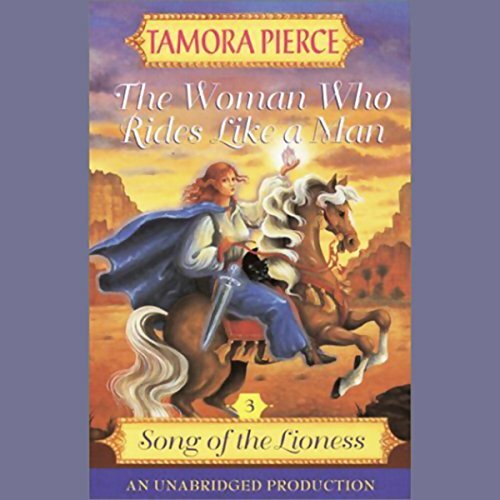 Would you consider the audio edition of The Woman Who Rides Like a Man to be better than the print version? Yes, but only because of the amazing narration by Trini Alvarado. She did a wonderful job distinguishing each character. What was one of the most memorable moments of The Woman Who Rides Like a Man? The first time the reader meets Kara, Ishak, and Kourrem. Trini's accents for them really added something to the story. Have you listened to any of Trini Alvarado’s other performances before? How does this one compare? Yes. I believe this to be one of her better one performances. (I'm not very good at coming up with tag lines.) Perhaps, "Sometimes you have to forge ahead alone when everyone else is against you." This is really good, in either audio book or book form, and I think the fourth book in the series is even better. If you enjoyed this one, definitely go check out "Lioness Rampant"! 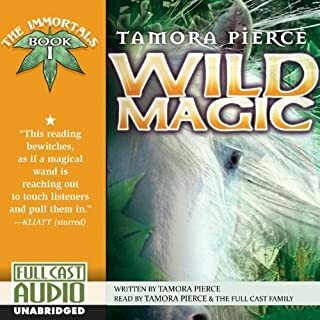 tamora pierce is one awesome writer and I would highly recomend her to all! I enjoyed listening to Trini's voice. I have silently read this book 3 times before getting the audiobook, and I like it just as much. there have been many other readers, where I can't even finish the sample! I look forward to listening to book 4, as long as Trini reads it. Third book in wonderful series! Great Read!!! This is the third book in an amazing series!! Love this author, she makes the characters cone alive off the page!! I feel as tho I have become part of the story and a friend of the main character as I finish her books!! Her pain was my pain!! Great Emotion!! I have loved this series and author for many years now. I wish there were several voices but I still enjoy these. Great writing, great story, great narrator. Overall of one of my favorite book series. I enjoyed it, not as much as the second one but it was nice enough.